The eleventh annual symposium on botanical medicine featured presentations on liver detoxification, chronic fatigue and fibromyalgia, interpreting lab results, inflammation, herb-drug interactions (what is clinically relevant? ), the pharmacy of flowers, little-known medicinal plants, medicine trees, memory enhancement, uncommon cardiovascular remedies, the many faces of testosterone, elimination of environmental toxins, botanicals influencing cyclic AMP, medicinal qualities of neem, TCM description and treatment for shen disturbances, and panels on longevity and diagnostic techniques. Keynote address by Bill Mitchell, ND. Speakers include Kerry Bone, Mary Bove, Amanda McQuade Crawford, David Crow, Cascade Anderson Geller, Bill Mitchell, Kenneth Proefrock, Robert Rountree, Jill Stansbury, Michael Tierra, Roy Upton and David Winston. Purchase the digital download of the lecture notes (PDF) and recordings (MP3) here on our website (see product listing on this page). Printed book of lecture notes available by special order. Contact us for information. 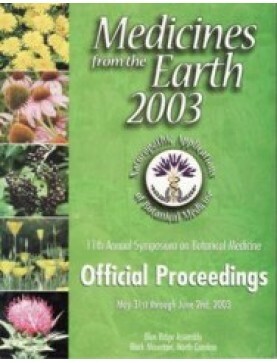 2003 Medicines from the Earth Symposium: Conference Book. Order download of PDF file on t..
Full Set of Medicines from the Earth MP3 recordings includes these titles (each about 1.5 hours long..
Panelists: Kerry Bone, Amanda McQuade Crawford and Michael Tierra. The closing panel of the sym..
Speaker: David Crow. This lecture describes the principles of community-supported plant-b..
Speaker: Kerry Bone. Continued from Part 1. This presentation begins by addressing the question of t..
Speaker: Kerry Bone. The causes of chronic fatigue are described: viruses, other microorganisms, imm..
Speaker: Mary Bove. Continued from Part 1 this comprehensive two part lecture begins with..
Speaker: Mary Bove. This comprehensive two part lecture begins with an explanation of the..
Speaker: Michael Tierra. In traditional Chinese medicine (TCM), Shen corresponds to our psycho-..
Speaker: Amanda McQuade Crawford. A timely discussion on risks associated with regular men..
Speaker: Cascade Anderson Geller. Folklore, medicinal uses, dosages and other information ..
Speaker: Kenneth Proefrock. Botanicals for use by practitioners in heart disease inc..
Speaker: Jill Stansbury. Continued from Part 1 this comprehensive talk begins with a descriptio..
Speaker: Jill Stansbury. This comprehensive talk begins with a description of the differences b..
Speaker: Kerry Bone. Traditional concepts for aiding liver function with botanicals are present..
Speaker: Mary Bove. Diagnostic techniques are described in depth. They include comm..
Speaker: David Crow. A philosophical discussion with a practical conclusion. Plants..
Speaker: Cascade Anderson Geller. Medicinal trees- anecdotes, clinical uses and general i..
Panelists: Mary Bove, Kenneth Proefrock, Robert Rountree and Roy Upton. A description of diagno..
Speaker: Bill Mitchell. An inspirational address for our times. Principles of pract..
Speaker: Jill Stansbury. Specific indications for the use of a full materia medica ..
Speaker: Kenneth Proefrock. The therapeutic uses of gelsemium, veratrum, monkshood, bella..
Speaker: Roy Upton. A description of the American Herbal Pharmacopoeia Project. &nb..
Speaker: Robert Rountree. Continued from Part 1 this lecture begins with a descript..
Speaker: Robert Rountree. This lecture begins with a description of the galaxy of t..
Speaker: David Winston. The various types of digestive remedies are described with ..
Speaker: Amanda McQuade Crawford. Explore the major plant constituents (alkaloids, carboh..
Speaker: David Crow. A discussion of the major rare medicinal oils and attars from India and th..
Speaker: Michael Tierra. Neem is regarded in India as the "village pharmacy." Find out wh..
Speaker: Jill Stansbury. This presentation reviews cellular biochemistry and botanical agents w..
Speaker: Roy Upton. This talk deals with herbal therapies for bladder infections and prostate e..
Speaker: Bill Mitchell. Continued from Part 1 this is an all encompassing discussion of many id..
Speaker: Bill Mitchell. This is an all encompassing discussion of many ideas rather than a clin..
Speaker: Amanda McQuade Crawford. Reliability of interaction reports are related to the myths a..
Speaker: Kenneth Proefrock. Testosterone plays an important role for both men and women, improv..